Born – 1953 Rodger McPhail was born in West Houghton, Lancashire. He spent time at both Coventry and Liverpool Art Colleges and at aged 19 he achieved the accolade of having the first of what would be many paintings published on the front cover of the “Shooting Times”. He is a prodigious talent and is recognised by many of his peers and many collectors as currently the finest bird artist in Britain. His versatility enables him to paint in either oils or watercolours and a further testament to his unrivalled ability is the skill he demonstrates when painting and drawing cartoons and caricatures. McPhail has spent years in the field tracking and studying the habits and character of his subjects, this experience and knowledge is clearly reflected in his work. Like all great artists, he has over time developed and improved his style and technique, so that now his paintings are noticeably superior to his very early works. 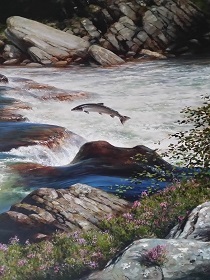 Rodger has held numerous exhibitions at The Tryon Gallery where his paintings have proved extremely popular and he has illustrated several books. His paintings are eagerly sought after both nationally and internationally and are to be found in some of the most important wildlife and bird picture collections around the world.